There are three colors and two letters which can be shown in icons in the Session History. You can view the commands being sent to the server and also the responses. If you have the service logging on, you can double click on the particular session and the whole history of the session protocol (log) will be displayed or can be saved into a file. This is a session when client on the server sends a message from Mail Client to the Icewarp Mail Server - it was received by Icewarp. This type of session occurs only when Icewarp Mail Server sends along an already received message to another Mail Server. This is a session where Icewarp Mail Server sends along the message which was received in previous Server session. Session history is stored just in the service memory. Only the last 100 sessions are stored in the memory, this memory is cleared with every single restart – this applies for all the services except for WebClient. 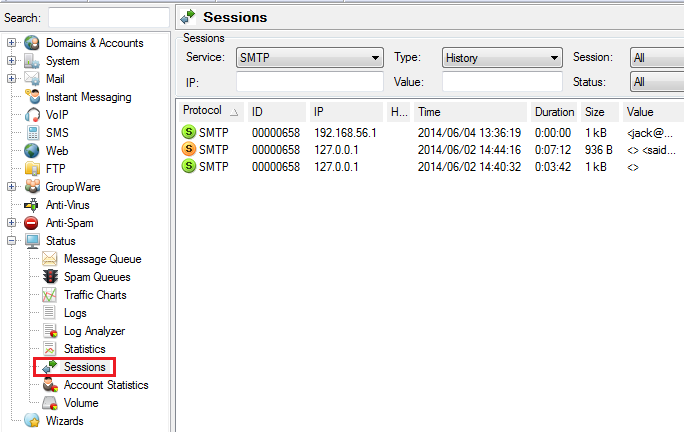 WebClient runs PHP sessions and only the ones which are not active anymore are visible in the history. For WebClient, the history shows all sessions which were not properly closed with a logout – so the session file exists in php\tempand because of this file, the entry shows up in history. Also note that if you close WebClient by closing the browser, the corresponding session remains active for 15 minutes after browser shutdown and then shifts into history.